Verify your Arduino is working and your IDE is properly configured. A simple blinking LED circuit is good for this. Download and load the HVRescue_Shield sketch and install it in your Arduino working folder. Open the Arduino IDE and click the “Upload” button. On older Arduinos, you’ll have to manually press the reset button on the Arduino first. Note that if you have the Rescue Shield installed on the Arduino and a target AVR in one of the sockets, the upload will most likely fail. Make sure the sockets are empty before uploading. Install the Rescue Shield on the Arduino. Make sure there is no target AVR installed in either socket at this point. The red and green LEDs will glow briefly as the Arduino finishes its reset, but eventually the green READY LED should turn on. Click the “Serial Monitor” button at the top of the Arduino IDE window. It’s the rightmost button in the toolbar, a rectangle with an antenna sticking out the top. The process shown here is the same for all programming modes. If you want to program the fuses on an ATtiny2313, select mode 2. 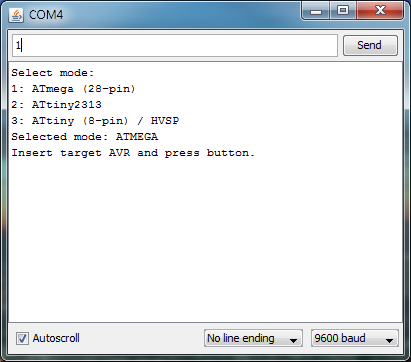 If you want to program an 8-pin ATtiny, select mode 3 (HVSP mode). Select a mode by entering the corresponding number. For example, here I have selected mode 1, ATmega mode. Insert the target AVR into the corresponding socket. IC1 is for the 28-pin ATmega parts, IC2 is for the ATtiny2313, IC4 is for 8-pin ATtiny parts. Push the button on the Rescue Shield, it’s labeled GO! The red BURN LED should turn on and the Rescue Shield will report the fuse settings currently stored in the target AVR. Then you will be prompted for new fuse values to send to the target. Enter the fuse values, in the form “0xFF”. The leading “0x” is important (the fuse value parsing code is very simple). The default values for an ATmega168 are given as a suggestion. Enter the fuse values into the box above the serial window, and click “Send”. In this example, I am entering an LFUSE value of 0xC7. 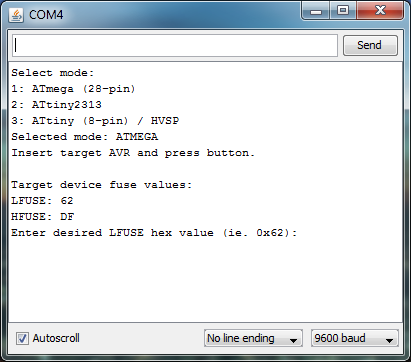 In this example, I entered 0xDF, the default HFUSE value for the ATmega168. If EFUSE support is enabled, you will need to enter a desired EFUSE value as well (not shown). If the fuses read back match the ones you entered, you’re done! The red BURN LED will turn off when the burn process is finished, and the green READY LED will come back on. Once the BURN LED is out, remove the target AVR. You’re done! If you want to change modes, remove the target AVR, close the serial monitor window, and click the Serial Monitor button to open it again. The Arduino will reset and and the mode selection prompt should appear within a couple moments. If you see garbled serial data during the mode selection, it’s probably because there is an AVR in one of the Rescue Shield sockets. Remove the AVR and try again. Options are listed immediately after the title block of the sketch. If you change options, you must recompile the sketch and upload it to the Arduino. Be sure to remove the Rescue Shield before uploading sketches to the Arduino. #define  DEFAULTMODE  HVSP // If running in non-interactive mode, you need to set this to ATMEGA, TINY2313, or HVSP. To disable interactive mode, set INTERACTIVE to 0. 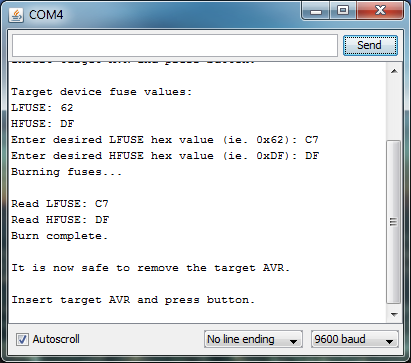 You will need to set the LFUSE, HFUSE, and EFUSE (if desired) values below to the desired fuse values. 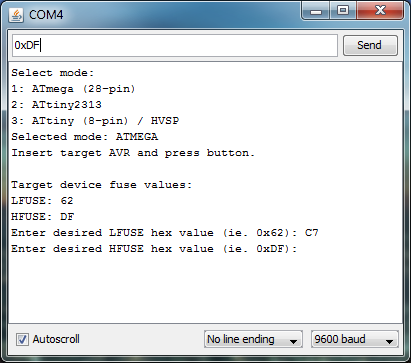 If you want to burn the EFUSE byte in addition to LFUSE and HFUSE, set the BURN_EFUSE option to 1.